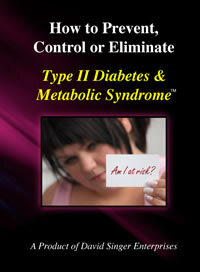 This PowerPoint presentation educates your audience about how to prevent, control or eliminate Type II Diabetes & Metabolic Syndrome. The current global prevalence of diagnosed diabetes is 165 million and is estimated to increase to 250 million by 2010 and to 330 million by 2025. These alarming figures do not include undiagnosed diabetes or pre-diabetic states. People with pre-diabetes are at increased risk for developing Type II Diabetes and for heart disease and stroke. When you have diabetes, you are more than twice as likely as people without diabetes to have heart disease or a stroke. If you have diabetes, your risk of a heart attack is the same as someone who has already had a heart attack. Diabetes is the sixth leading cause of death in the U.S. Metabolic Syndrome affects 7 million adults in the U.S.
With your help, we can reduce the incidence of Type II Diabetes and metabolic syndrome in this country.